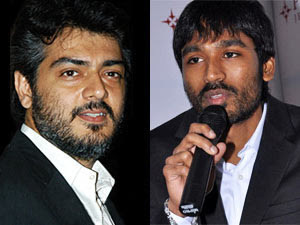 Actor Ajith and Dhanush – Who Will Emerge Victorious? Priyamani while speaking about her film Charulatha said, "This is a heroine oriented story. The story is inspired from a foreign film. This film is being produced in Kannada and Tamil. This film is not being dubbed in Tamil. This is a direct Tamil film. The story of this film is about twins born confounded. When I heard the story, i found it was very challenging so I accepted it. We have seen these kinds of twins in newspapers and TV channels only. I have not seen them personally. How difficult it would be for them. There will be so many problems like anatomy and medical problems. There will be many more problems. On the whole this is a tough role. Many are asking me that whether I am ready for this role. Yes. I don't want to lie by saying that I had learnt their body language by sitting with them for 10 days. I have only read that how their body language will be. That's all. There is also a question that whether the twins will come confounded in the film Charulatha. They will come confounded as well as separately. I cannot narrate the whole story. This is a fantastic thriller film. The films nominated for the South Indian International Awards (SIIMA) is out finally. Two major films that are facing a head-on competition are Mayakkam Enna and Aadukalam. Interestingly, both the films star Dhanush as the hero. Mayakkan Enna and Aadukalam have been nominated under the Best Film Category and Best Director Category. Yet another biggie that has made it to the nominations is Mankatha. Ajith's name features in the nomination for the Best Actor and Best Male Negative Role categories. Want to vote for your favourites to see them win? Cast your vote now at www.siima.com. The award distribution ceremony will happen in Dubai on June 21st and 22nd. Noted celebs like Madhavan, Parvathy Omanakuttan, Shruti Haasan, Hansika, Amala Paul, Priya Mani and others will make it to this event. Siruthai was released some 1 ½ years back. Saguni is now being released after Siruthai. After Siruthai, people who came to narrate stories to Karthi said that he will be donning police officer role but Karthi smilingly refused these offers. He had mentioned that if he acted in stereotyped roles it would be boring for him. After listening to many stories, Karthi had agreed to act in Saguni. So far Karthi has not acted in the films directed by debutant directors. The reason for Karthi to work with debutant director Shankar Dayal is because of the screenplay and dialogues. The first half of Saguni will be humorous while the second half will be sensational. This is a political film. Karthi is donning the role of a person who uses to tackle the people with muscle power and man power with his ingenuity. There is Pranitha for glamour and Santhanam for comedy. So Karthi is very confident that with this combination, this film is bound to be a super hit. Lot of popular actors like Nasar, Prakash Raj, Kota Srinivasa Rao, Radhika, Roja and Kiran are sharing the screen with Karthi in Saguni. Neetu Chandra who had acted in the Tamil film Yavarum Nalam has now paired with Jayam Ravi in the film Aadhi Bhagavan directed by Ameer. She who is currently acting in an International film said, " Though I am in a foreign country, it is not comfortable as our native place. For the last ten days I am in a foreign country. I am waiting for the shooting to complete in order to rush to Mumbai. I have never even thought of acting in an International or Hollywood film. I was not interested in that but sometimes unexpected things happen. That is the way I got that opportunity. Many are asking me that whether I am in love with the Hindi actor Randeep Hooda. Matters regarding to my acting and related to that only should be known to the public. I feel like that. News regarding my personal life is unnecessary. I don't want to speak about that. It is not necessary for others to know about it."